The Lotus Esprit Turbo X180R sports car. In 1990, Lotus decided that, in order to promote the Esprit in the lucrative US market, it needed to develop, based on a very tight budget, a sports racer to compete in the SCCA America World Challenge, a series for modified production sports cars. One of the conditions of entry was that very few modifications would be allowed, the purpose of which was to keep costs as low as possible. As a result, two Esprits were taken off the production line and were converted into competition versions. The car chosen was, essentially, based on the Lotus Esprit SE road car, which was launched in mid 1989. It was designated the Type 105, and featured redesigned rear wings and front spoilers. It embodied a chassis, whose origins came from Formula 1 development, and which produced superb handling, grip, and braking. It was powered by a charge-cooled (intercooler), 2.2 litre, Lotus 910S engine, which developed 285 bhp, as well as strong torque characteristics in the lower rev band, which was ideal for road race circuits. The Type 105 was also built in the form of twenty road going versions. The Type 105 SCCA car formed the basis for the creation of a new road supercar, which was designated the Esprit X180R. It featured air conditioning, sports seats, and a chassis that was zinc galvanised. In the 1990 competition season, the Type 105 notched up 4 wins in 8 meetings, including 2 first or second placings, 6 pole positions and, whilst covering a total of 2,900 miles, it was not subject to a single mechanical breakdown. Furthermore, in 6 of the 8 meetings, it set the fastest lap times. In 1991, the Lotus works team entered three X190R's, which were now designated Type 106, into the SCCA (Sports Car Club of America) World Challenge. The 1991 X190R variant used larger alloy wheels, a strengthened chassis, and offered more power since its now highly tuned engine was able to produce 300 bhp at 6800 rpm, and 310 ft/lbs of torque at 4800 rpm. Such output was possible since the Lotus 910S engine used larger fuel injectors, an upgraded charge-cooler, and an exhaust system without a catalytic converter. 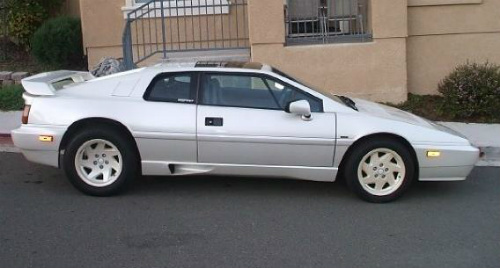 It is worth noting that the X190R weighed an incredible 300 pounds less that the Esprit Turbo SE. Lotus had a four car works team and, in 1992, the driver line up included the actor Paul Newman. The car was entered in the 1991 to 1993 race seasons, with it taking the Driver's Title in the SCCA Supercar Championship in 1992. In 1993, since the X190R cars were so successful, the IMSA, the ruling body of the SCCA, changed the rules in order to help other manufacturers and competitors. Accordingly, the Lotus works team was required to incur a weight penalty of 300 pounds for being so successful. As a result, the X190R lost its competitiveness.